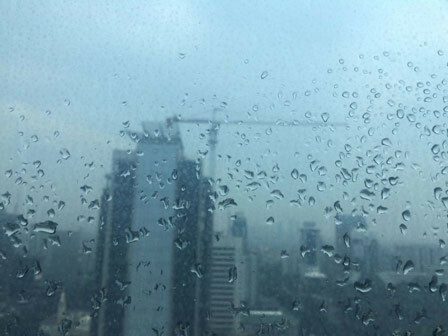 Light moderate rain is predicted to fall from morning in several Jakarta regions. Citizens should be aware of weather change.
" Moderate heavy rain is potential to fall with lightning and strong wind between afternoon and night"
"Morning is cloudy, light rain to fall Seribu Islands," mentioned Hary Tirto Djatmiko, Head Division of BMKG 's Public Relation, Wednesday (11/7). In afternoon, it will be cloudy but light rain is predicted to fall in North Jakarta, Central Jakarta and moderate rain in West Jakarta, East Jakarta, and South Jakarta. While at night, light rain will fall in Seribu Islands and North Jakarta. "Mostly cloudy at dawn but Seribu Islands will be rain," he added. Temperature could reach 24-32 Celsius degree today with humidity 70-95 percent. Wind blows from north to southeast within 05-22 kilometers per hour. "Moderate heavy rain is potential to fall with lightning and strong wind between afternoon and night in West Jakarta, East Jakarta, and South Jakarta," he asserted.